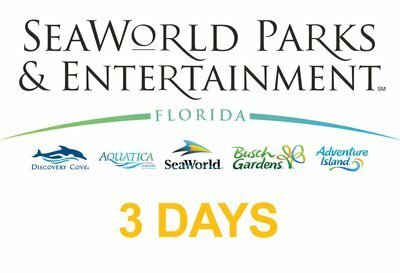 SeaWorld Parks & Entertainment™ inspires millions, through the power of entertainment, to protect animals and the wild wonders of our world. The company is best known for its 12 U.S. theme parks, attractions that hosted more than 22 million guests in 2015 and include the globally recognized brands SeaWorld®, Busch Gardens®, and Sesame Place® brands. The parks offer guests a variety of up-close experiences, from animal encounters that invite exploration and appreciation of the natural world, to thrilling rides and spectacular shows. Florida: SeaWorld Orlando, Discovery Cove® Orlando, Aquatica™ Orlando, Busch Gardens Tampa, Adventure Island® Tampa. Reservations will be confirmed within 1 business day of your order by Portal Orlando. You will receive an additional email with your e-ticket information. E-ticket can be displayed directly at the entrance of each park. Once your order is confirmed e-tickets are non-refundable and cannot be changed.